Save $300 to $1,000 per couple off this sailing in certain cabin categories when you book and pay in full. Click here for eligible departures. Save up to 40% off this river cruise in certain categories. Click here for eligible departures. 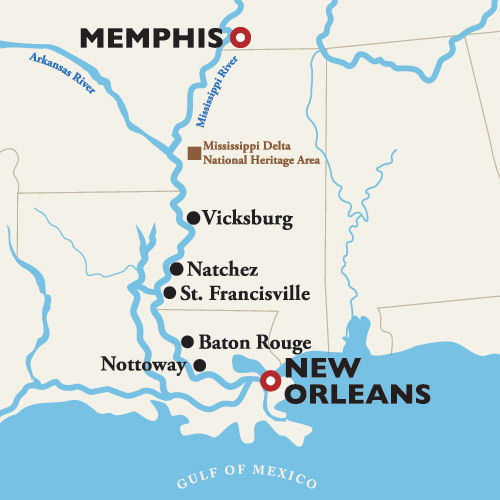 Please note: The April 21, 2019 departure has an altered itinerary due to historic high water on the Mississippi River and inaccessible ports. And if you don’t know where to start – a quick stop to the Hospitality Desk can help! The desk will be located in the official Pre-Cruise Hotel and open for your convenience between 2:00 PM and 7:00 PM. Here, an AQSC representative, with the help of a local Memphis representative, will happily provide you with dining, entertainment, and sight-seeing suggestions to help you make the best of your time in Memphis. While here, discover everything you need to know about your upcoming voyage. Our friendly staff can assist with everything from general questions to reserving shore excursions. Yesterday’s Children was featured in Southern Living, Delta Magazine, and Dolls Magazine. Enjoy a self-guided tour featuring over 1,000 dolls and toys dating back to 1843. At the Biedenharn Coca-Cola™ Museum, enjoy the wide variety of Coca-Cola™ memorabilia in an authentic candy store and soda fountain setting. This building is where Coca-Cola™ was bottled for the first time anywhere in the world in 1894. Hop off at the Louisiana Art & Science Museum to explore the new and exciting displays and exhibits they have to offer. The museum features more than 4,000 artworks and artifacts. Changing displays of selected objects from the permanent collection are often on view in two small galleries. Also on display, is the Ancient Egypt Gallery, one of the museum’s most popular year-round attractions, featuring a mummy dating back to 300 BC, resting inside a reconstructed Ptolemaic era tomb. You won’t want to miss this incredible stop! Established in 1809, St. Francisville is the oldest town in the Florida Parishes. Below where St. Francisville is located currently, was a settlement called Bayou Sara in the 1790’s. When this settlement was destroyed by flooding and fires, many of the structures and artifacts were hauled up the bluff into St. Francisville, where they are still standing. The town is referred to as “two miles long and two yards wide,” but that definitely doesn’t mean they have nothing to offer! Stop in at one of the unique shops, historical homes, beautiful churches, or breathtaking parks and you will agree with that! Spanish moss trees grow throughout the town, lending a beautiful southern comfort to the atmosphere.